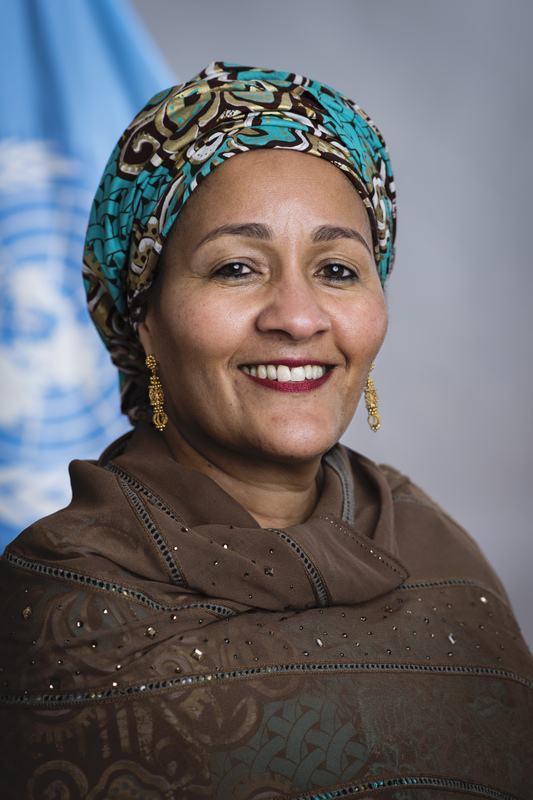 'Climate action is unstoppable because it makes business sense', said the UN Deputy Secretary-General Amina Mohammed during the opening session of the SD Talks Special Series on Climate Action which took place on 3 May 2017. It was the first in a series of webinars on climate action. The webinars in this series aim to advance knowledge and further dialogue around Climate Action, in the lead up to and beyond COP23, which took place in November 2017 in Bonn, Germany. 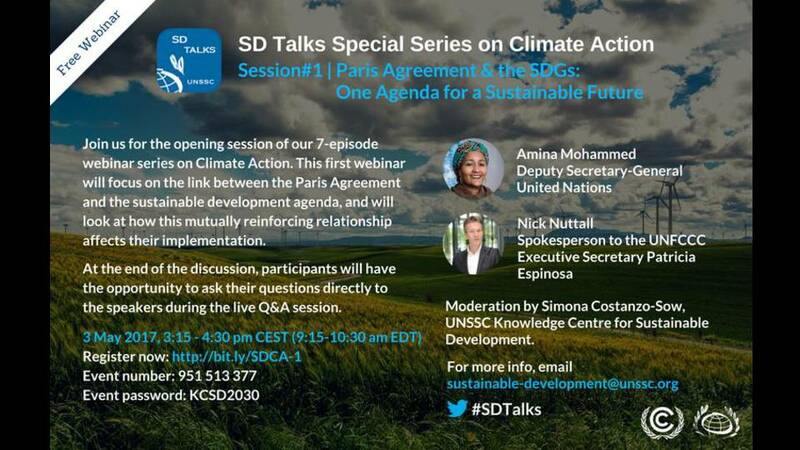 Titled Paris Agreement and the SDGs: One Agenda for a Sustainable Future, this first webinar featured Amina Mohammed, UN Deputy Secretary-General and Nick Nuttall, Spokesperson for UN Climate Change. The discussion was moderated by Simona Costanzo-Sow of the UNSSC Knowledge Centre for Sustainable Development. The webinar, which received over 500 registrations from more than 100 countries within a matter of hours, discussed the importance of approaching efforts to achieve the sustainable development goals and the targets of the Paris Agreement on Climate Change in an integrated manner. It emphasized that although the 2030 Agenda and the Paris Agreement were negotiated separately, they are all implemented together at country level. 'Climate action and sustainable development are two sides of the same coin. At the country level, these things happen together', said Ms. Mohammed. Read the full article here. To find out more about the UN Climate Conference in Bonn, please click here. Full text of the 2030 Agenda for Sustainable Development can be downloaded here. Full text of the Paris Agreement and other related information can be found here. The Paris Climate Change Agreement set the goals, and now countries must translate them into action. The Nationally Determined Contributions (NDCs) set out what each country plans to do as part of the Paris Agreement to contribute to the international effort to secure a sustainable future for all. This webinar explained how NDCs open up a new universe of economic and cooperation opportunities to realize the mitigation and adaptation plans and increase climate resilience. Between 6-17 November, thousands of government delegates and leaders from all sectors of society gathered in Bonn (Germany) for the 2017 UN Climate Change Conference. Under the Presidency of Fiji, UN Climate Change with the support of Germany hosted this annual meeting with one clear objective: making progress for a successful, inclusive and ambitious implementation of the Paris Agreement. This included negotiations on the implementation guidelines—or operating manual—for transparent climate action under the Paris Agreement, as well as showcasing cooperative climate action, including on vulnerability and resilience, from around the globe. This webinar explained the milestones and key challenges that lay ahead of COP23. Non-Party Stakeholders are essential in the global effort to realise the goals of the Paris Climate Change Agreement. Wide-ranging cross-sectoral partnerships will be fundamental for nations to fulfil their objectives. In November 2017, the UN Climate Change Conference (COP23), showcased a wide array of the thousands of leading examples of game-changing climate actions from the private sector, cities, and other sub-national governments across the world but more commitments and urgent actions are needed. This webinar highlighted the great momentum for more ambition and cooperation from all parts of society. During COP23, the people behind some of the 2017 Momentum for Change Lighthouse Activities demonstrated how they are creating positive impact in the lives of people, communities and on the planet´s health, through innovative approaches. The Momentum for Change initiative is spearheaded by UN Climate Change to shine a light on some of the most innovative, scalable and replicable examples of what people are doing to address climate change. This webinar featured Laura Stachel, who presented 'We Care Solar', Trevor Bell, presenting 'SmartICE', and Giulia Kathleen Houston, presenting 'From Waste to Wow'. This webinar featured Patricia Espinosa, Executive Secretary of UN Climate Change, who discussed the key outcomes of COP23, including with respect to the negotiations and the implementation of the Paris Agreement. The webinar also highlighted the measures undertaken by non-party stakeholders and underlined the next steps following COP23. 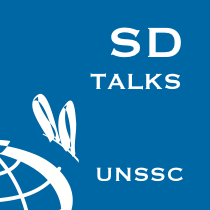 For more information, please email sustainable-development@unssc.org.